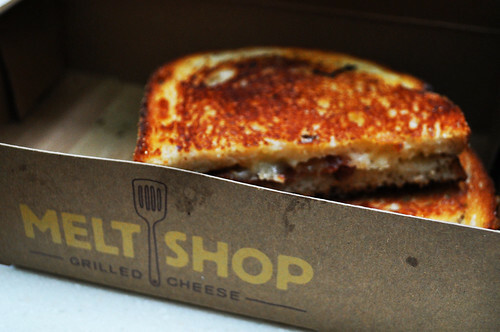 Sunday mornings are perfect for grilled cheese sandwiches, making The Melt Shop a destination for lunch with Marcus a couple weekends ago. 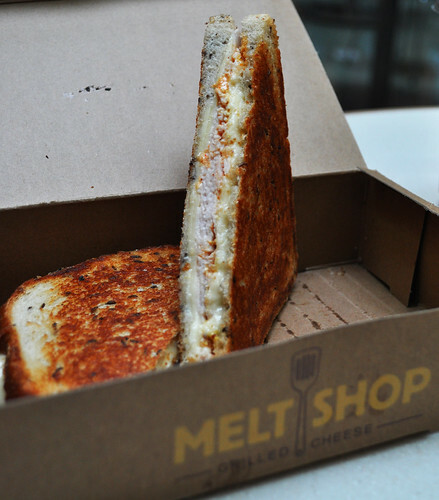 The Melt Shop is actually just a "counter"-style joint set up al fresco. There are some tables set up right in front (it's in an open courtyard, down one floor from street level). If it's chilly out or if the elements are unfriendly that day, there is public seating inside the building in which the shop is connected. It was opened by Spencer Rubin, a Cornell Hotel School grad, "to cater to the kid inside everyone by serving a few childhood classics, while appealing to the mature palate with sophisticated variations of the world's most famous sandwich." Mr. Rubin also has Chef Katy Sparks as The Melt Shop's culinary/chef consultant. Everything is made to order, so we were patiently waiting for our food to be ready. I decided to go with the aged cheddar grilled cheese with maple glazed bacon on sourdough. My three favorite things, all lopped together in one of my favorite sandwiches of all time -- can't get simpler than this. Melted cheese? Check! Sourdough bread? Check! Crispy bacon? Check! Check! Check! Each side of the sandwich was toasted/seared/browned very well (the bottom side was just a bit overdone, though), and the grilled cheese's contents were perfect. I ordered a homemade tomato soup to have with my aged cheddar grilled cheese sandwich. 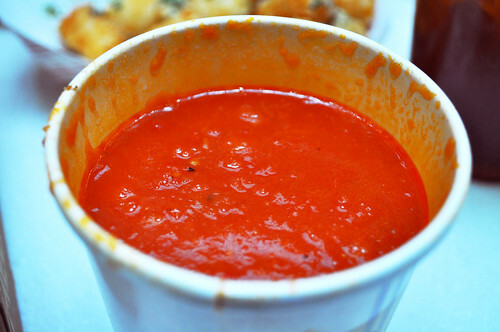 The homemade aspect of this tomato soup was what sold me, and it was soo good, especially with my grilled cheese. It was nice and chunky, but not creamy (which would render me a twisting stomach in minutes), and you could still feel the texture of the nearly melted onions within the soup. The combination of salty, savory, and a tinge bit sweet meshed well with the melted and toasted goodness that encapsulates the best grilled cheese sandwiches. Only complaint as a ratio eater is that there wasn't enough grilled cheese to get through this soup! Maybe a smaller portioned soup or a larger grilled cheese would help remediate this! Marcus had the smoked turkey reuben with swiss, smoked turkey, and melt sauce (he held the mustard, red cabbage slaw, and red onions -- not really a reuben anymore, I suppose, haha). Considering Marcus was a bit dubious about going to a shop that only has grilled cheese on its menu, it was nice to see that thought completely dissipate once he told me that this was probably the best grilled cheese sandwich that he's ever had. I love it when they slice the grilled cheese sandwich diagonally -- makes for easier eating on the first bite. "Melt sauce" at The Melt Shop is almost like Shake Shack's "Shack sauce" -- a mayonnaise-based "mystery" condiment, giving the sandwich a flavorful moist layer against the meat/cheese/bread. We also had a side of shop tots with melt sauce. 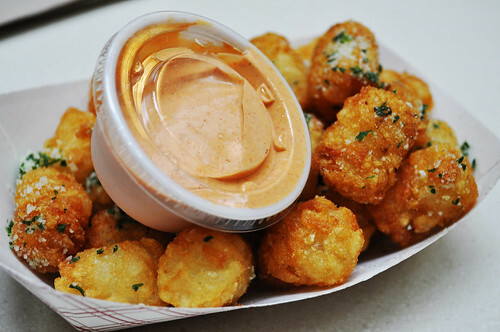 Can never go wrong with a side of tater tots, especially since the ones at The Melt Shop are deliciously crisp and brown, and the melt sauce goes great with them. 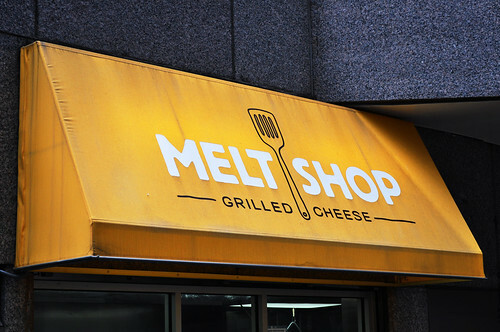 Findings: If you're jonesing for a solid grilled cheese sandwich, The Melt Shop is the perfect destination. There will be something on the menu for grilled cheese aficionados and connoisseurs alike. The homemade tomato soup and a side of shop tots are great additions to any grilled cheese sandwich there, too. Price point: $6.95-7.95 for each grilled cheese sandwich, $2.95 for shop tots, $3.50 for tomato soup.